Texas became the 28th state on December 29, 1845. The Capital is Austin. Texas is the second largest state by area and unless you’ve driven through Texas it is hard to comprehend the size. Our Texas adventures have taken us through the Texas Panhandle, mesquite and cactus covered plains, the green rolling hills of the Texas Hill Country, and the beautiful Texas Gulf Coast. Along the way we camped by beautiful lakes, near the Gulf Coast, in the second largest canyon in the United States, and a quite a few places in between. As we drove around the back roads we saw canyons and creeks, dance halls and wineries, historic sites and ranches, quaint small towns and old homesteads, toured museums, made a few hikes, attended a fiddle fest and chuck wagon races, met wonderful Texans, and saw more wildflowers than I ever imagined. The lighthouse trail at Palo Duro Canyon, Enchanted Rock, and the Devil’s Waterhole Trail at Inks Lake were some of our favorite hikes. The official Texas Longhorn herd is divided between a few state parks. At Copper Breaks State Park and Palo Duro Canyon State Park we saw them up close. We planned a spring trip to Texas so we could see the bluebonnets in bloom. Texas is the only place on earth where some of the bluebonnet varieties bloom naturally. There were also many other wildflowers along the way. We found some wonderful places to camp. We especially enjoyed camping at many Texas State Parks. Rain and fog couldn’t keep us from enjoying the three state parks and Padre Island National Seashore along the Texas Gulf Coast. 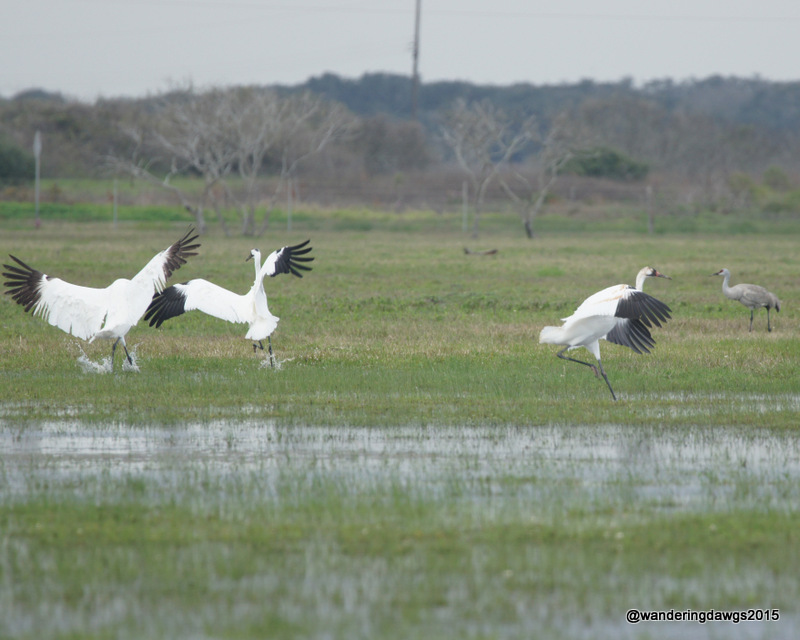 There are many varieties of birds along the Texas Gulf Coast. Texas Horned Lizards, Cottontail Rabbits, mule deer, white tailed deer, prairie dogs, and wild turkeys are some of the wildlife I was able to capture. Being serenaded, attending a fiddle fest, listening to music in a dance hall, touring the Buddy Holly museum, going to Luckenback, and seeing signs about Willie Nelson reminded us of how important music is to the Lone Star State. For us, no trip to Texas would be complete without sampling some of their fantastic steaks and barbecue, especially the brisket. In Paris, Texas we stopped to see the Eiffel Tower with a red cowboy hat and attended chuck wagon races. There were interesting things to see all around the state. One of the best things about visiting Texas is meeting native Texans. Without fail, every Texan we met was proud of their state and eager to share their favorite places to visit or where to find the best brisket. One woman I met had so many good suggestions about places to go I had to get a notebook out of the truck to take notes! 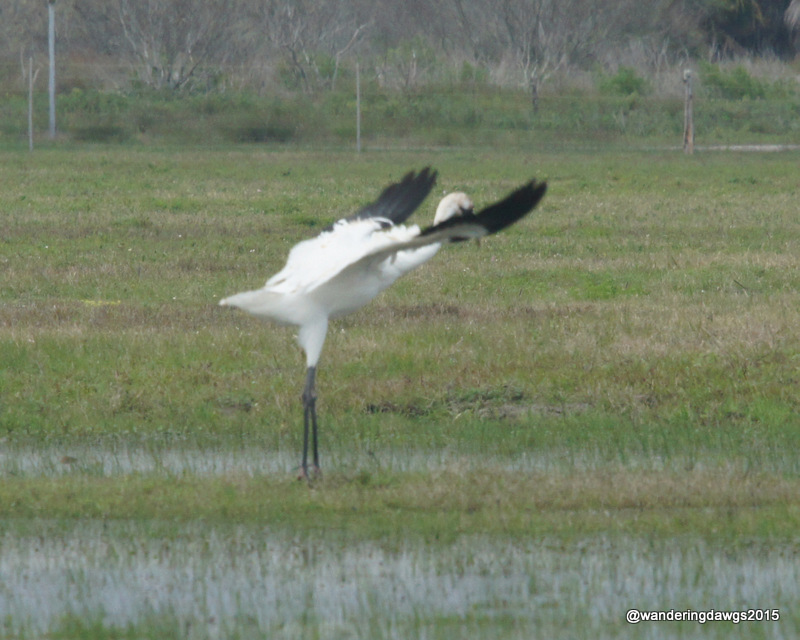 Our main reason to visit Goose Island State Park was to see the endangered Whooping Cranes. They are the tallest birds in North America and stand nearly 5 feet tall with a wingspan of about 7.5 feet. 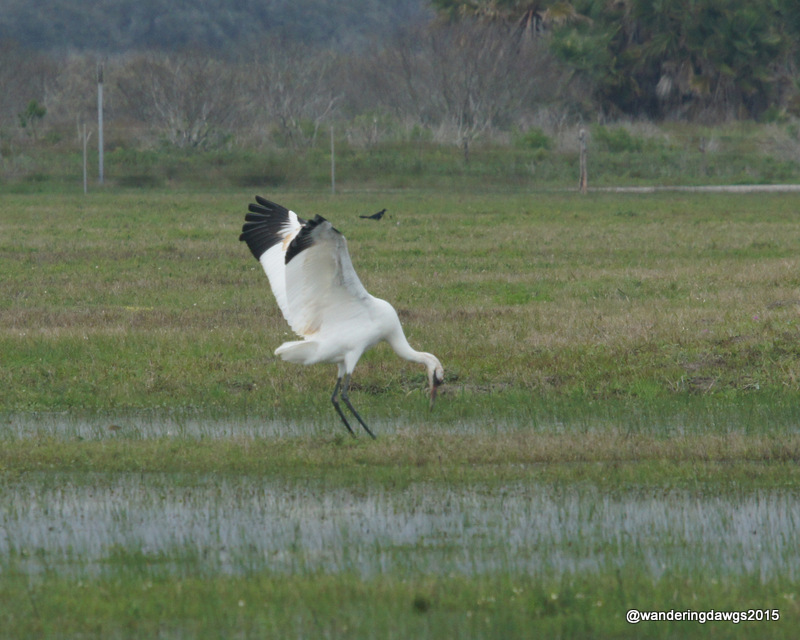 Beginning in September or October each year, the cranes migrate south about 2,500 miles from Wood Buffalo National Park in Canada to Aransas National Wildlife Refuge about 35 miles north of the state park. After wintering in Texas, they begin their migration back north to Canada about mid March each year. 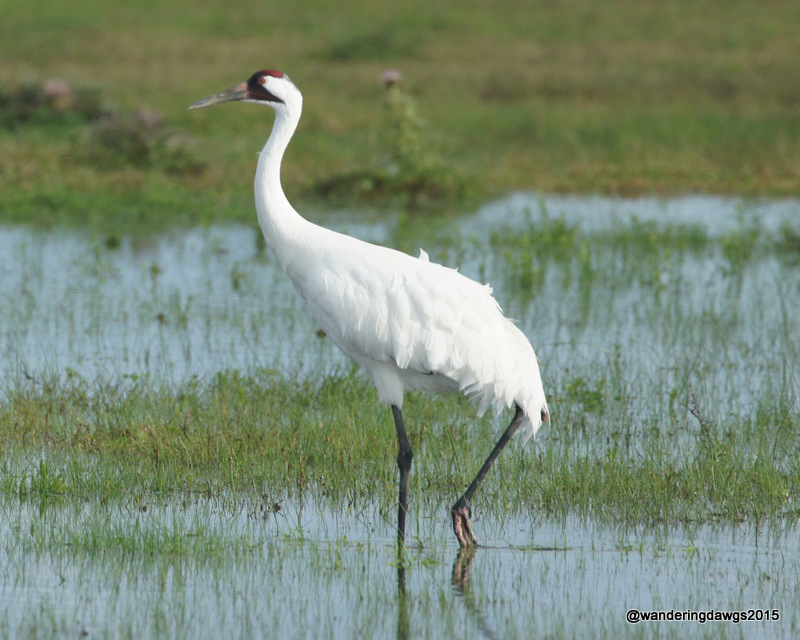 In the 1940’s, the Whooping Crane population had dwindled to about 20 individuals. 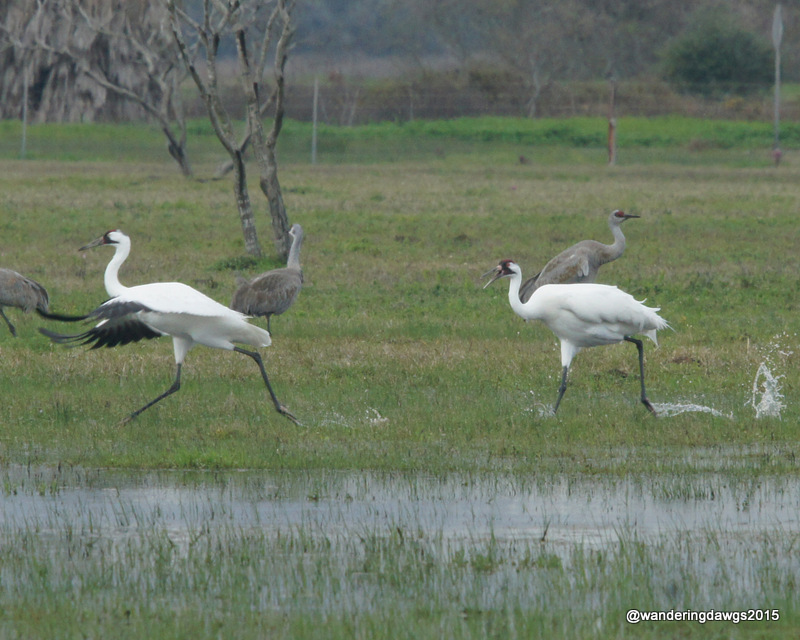 Today, according to the International Crane Foundation, there are about 599 (captive and wild). 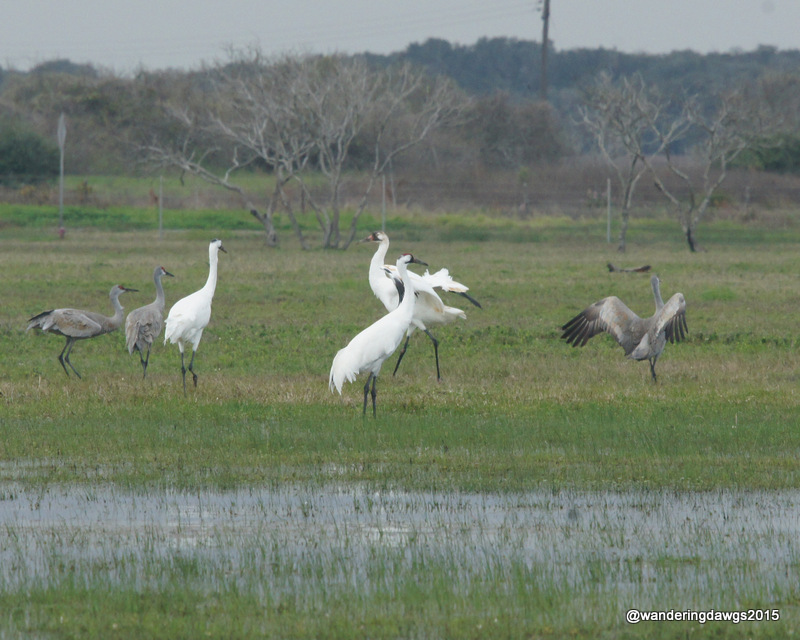 A survey conducted in 2013-2014 estimated about 300 of the wild population winter on and around the Aransas National Wildlife Refuge. A few of these spectacular birds sometimes make their way to a farmer’s field near the state park. There they feed and hang out with the cattle. 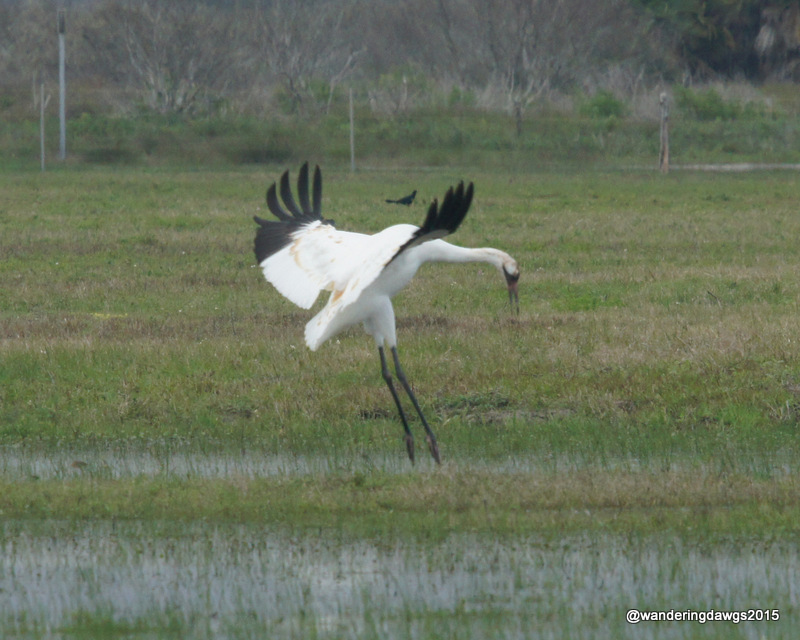 There were sometimes as many as 11 Whooping Cranes at one time scattered around the field. Many thanks to Ingrid over at Live Laugh RV for the heads up on where to see them. We went by the field every day to see what the Whoopers were up to. With their large size and brilliant white feathers with a rust colored spot on their head they are easy to spot. 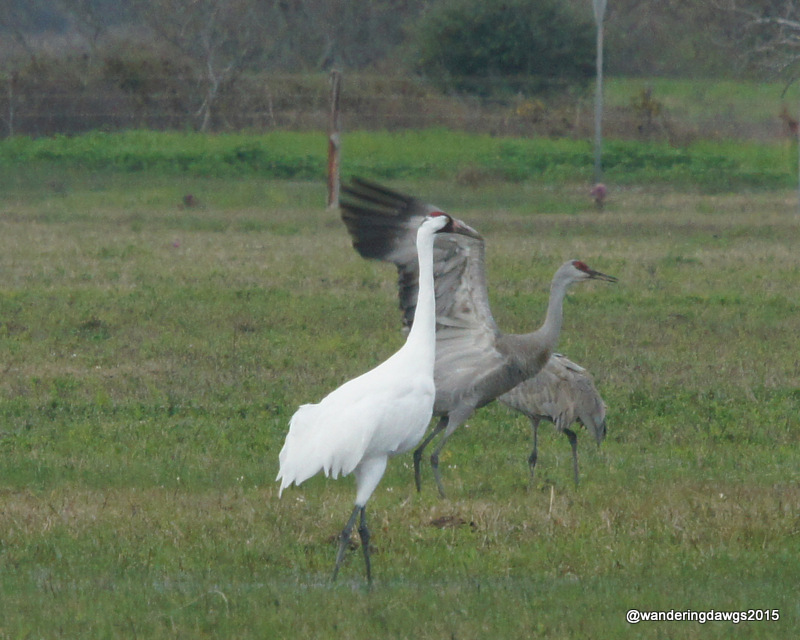 Sometimes there would be Sandhill Cranes hanging around in the field, too. 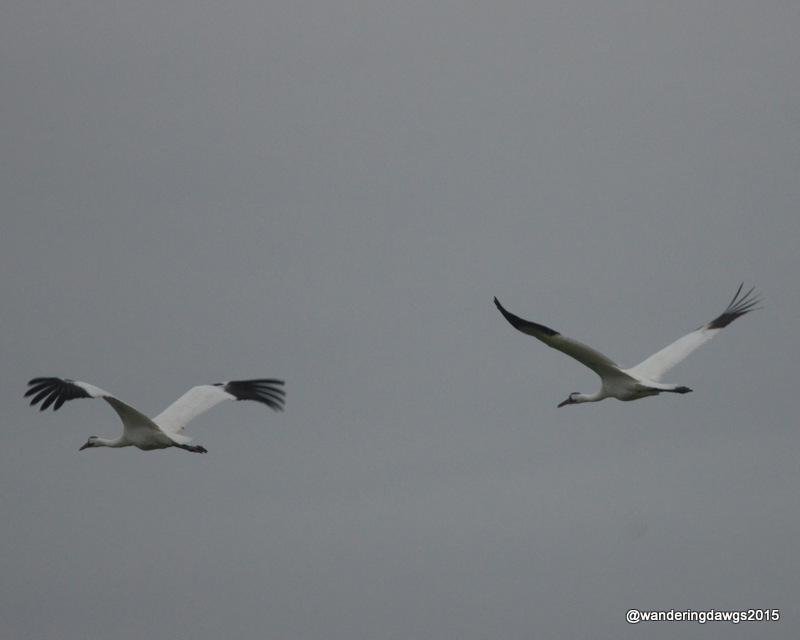 They are smaller than the Whoopers and have darker feathers. 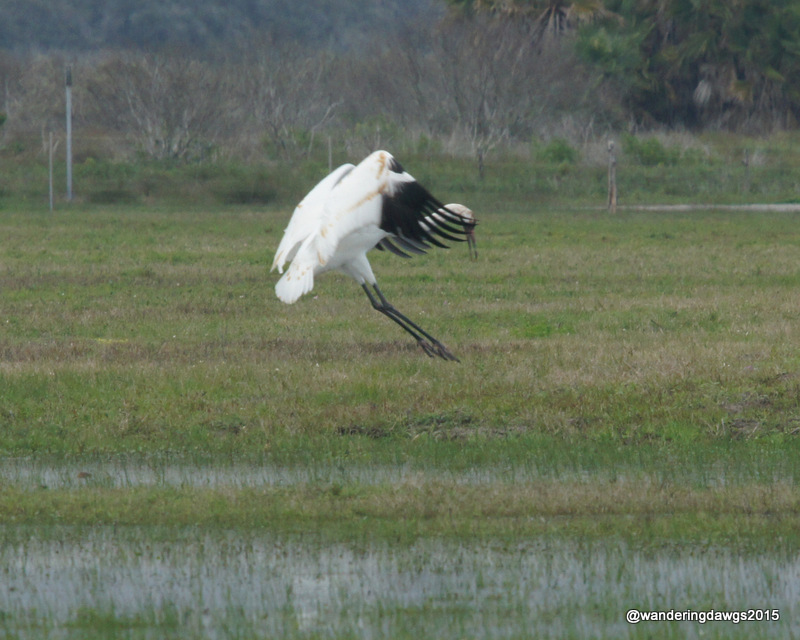 One afternoon the Whoopers kept us entertained flapping their wings and jumping around. When they took off it was sad to see them go but spectacular to watch. 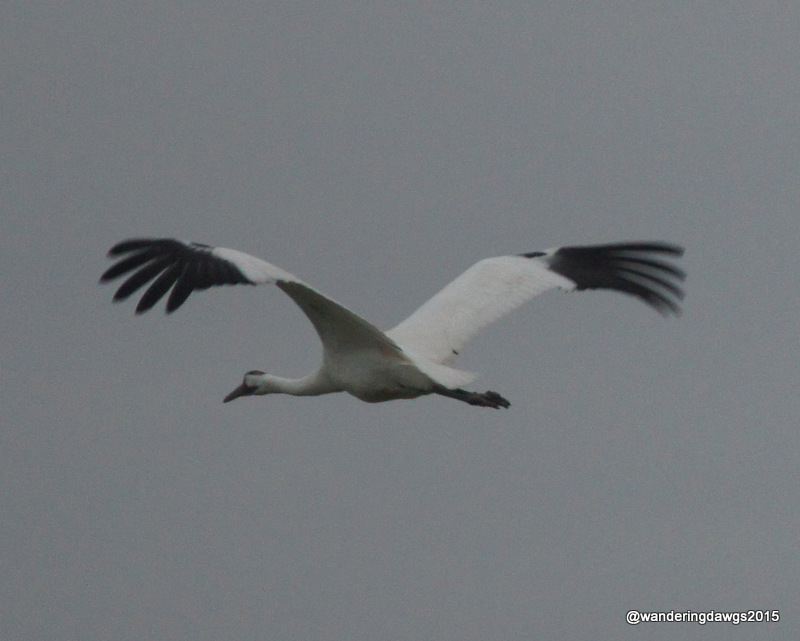 The Whoopers were the star of the show but all around them there were a lot of other things going on in the field. I’m happy to know that due to the work of many people, the population of these birds continues to grow. I feel privileged to be able to see them in the wild.